This is a very interesting essay from a website I visit periodically: Multifactor world, written by Jared Kizer. Basic thesis is that the S&P 500 returns have been out of this world since the global financial crisis and is highly unlikely to repeat this performance in our lifetimes. And the Sharpe Ratio has been even further out of this world! He makes this argument with bootstrap analysis. He gives a very good explanation of bootstrap analysis and it’s distinction from Monte Carlo Simulation. I think it’s a great read, and recommend checking in on his website periodically for his roughly monthly essays. I suspect that we could see this kind of return again. We'd just have to have that kind of downturn first. Not a fan of the premise, who expects 16.5% after dividends annually in perpetuity? Great link & input Dave! Statistics's, probabilities I've heard and as you suggest the sharp ratio's metrics all support this beliefs assertion. Interesting article. It certainly puts in perspective how great of a run it has been for the S&P. I've got a long ways to go so maybe I'll get lucky and see a period of returns like that but by no means do I expect it. The grim 10 year forecasts (which I tend to believe, absent any major changes in valuations) all appear to be predicated in the market not crashing. That seems pretty unrealistic. Look at those beautiful normal distributions! I think Mandelbrot would write a chapter about the flaws in that piece. One thing neglected in the article: inflation / interest rates were lower over the "Supernova" period...like unusually lower. The author should have used post inflation returns. I would like to see this analysis performed on a global stock and bond portfolio. I wonder what that would look like. The article has a reasonable conclusion: near future returns are likely to be lower than unusually high near past returns. I guess some people that believe in that call it mean reversion. Certainly current valuations imply the future mean expected return is lower. What I think relatively few people appreciate is that current valuations also imply the whole future potential dispersion of returns shifts left as well: less good good outcomes and more bad bad outcomes. For me, thinking in terms of the dispersion of potential returns makes me much less inclined to take risk. Your point only AMPLIFIES the author’s points. Add left skew and fat tails to the implications of the essay, and thinks look worse. Sure. The point being that the article is cherry picking the period with highest returns and saying "don't expect these high returns to continue". However, if you just extend the timeframe out a few years, you get pretty normal returns over the period in line with historical returns. Basic thesis is that the S&P 500 returns have been out of this world since the global financial crisis and is highly unlikely to repeat this performance in our lifetimes. That is a really stupid thesis. Seriously. It's already repeated twice in my lifetime, in the 90s and in the 2010s. These kind of large 10-year returns happened in the 1920s and they happened in the 1950s too. 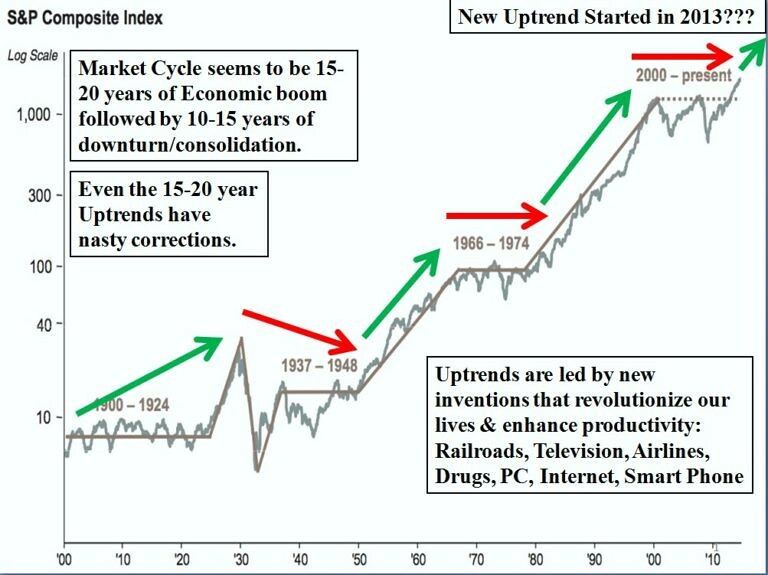 This is how the stock market has always worked so far. It goes in cycles. You get 10-15 bad years of 3%, and 10-15 good years of 15%, and you end up with 20-30 year returns of 9%. The NEXT ten years are not likely to return 15% a year again. It would make total sense for the next 10 years to have poor returns (but no one knows for certain), but to say that we will never see a multi-year bull market of 15% a year again in our lifetimes is ludicrous. It may be true (I will admit I can't predict the future either), but it's still a ludicrous statement to make. The last 20 years, SP500 had an annualized return of only 4.24% (according to my calculations). On november 30th 1998 SP500 was at 1176. Shouldn't I expect the next 20 years to be better? This bull market which is about 10 years old has produced massive gains with little in the way of volatility. The Fed with its ultra-low interest rates, QE, and purchases of Treasuries and mortgage backed securities drove interest rates to historical lows and kept them there for long years. Basically risk free assets yielded essentially nothing which pushed investment dollars into risk assets like stocks. In short the Fed acted as a backstop for US equities and money flowed for years in an essentially constant stream into the S&P 500. That increased stock prices while the Fed offered a backstop against another bear market, producing high Sharpe ratios for the S&P 500 during that period. Things have changed. Interest rates are rising slowly and modestly and the Fed is reducing the size of its balance sheet, the opposite of its prior monetary policy. It is entirely possible and IMO likely that going forward from here there will be more volatility in the equity market and that bond returns are likely to be slightly greater than inflation. How alternatives will do in this scenario is not clear to me, but I suspect that returns of all quality assets like low risk bonds and broadly based index funds will be positive long term but likely lower than the robust returns we've gotten used to. How much lower? No one knows. That's a guess, hopefully an educated one, but like all guesses it can turn out to be wrong. It's important to recall that this decade-long high Sharpe ratio for the S&P 500 was preceded by the greatest collapse in large cap stocks since the Great Depression, an S&P 500 loss of 56.4%. If we add the years of 2007 - 9 to the evaluation that nice reassuring Sharpe ratio will likely disappear. Predicting the market's future based on backtesting is not as easy as it sometimes seems. 1) But half of that was just climbing out of the hole. 2010-2017 inclusive: CAGR 13.76%, Sharpe ratio 1.13. 1992-1999 inclusive: CAGR 19.59%, Sharpe ratio 1.17. So the 1992-1999 seems to have been better than the period since the global financial crisis, both in return and in Sharpe ratio. And the earlier period was all gain, it wasn't climbing up from the bottom of a crash. So does somebody finally know something? Or is this noise? I can’t get back my time reading this if it’s noise. So here's the question that presents itself to me: is this going to make a difference in the way I invest? Answer: nope. Still invested in broad-market index funds, still holding, still rebalancing. SP500 returned 17.37% annualized for the 25 year period ending 1999. $1000 turned into $54,000. Why is the current 10 year run considered that incredible? I feel like we're in late 1998 right now, as far as future 10-15 year returns go. But who knows. The blue curve is Total Stock, VTSMX. The red curve is Total Stock shifted back in time about eighteen years, so that 2010-2018 overlay 1992-2000. Yes, 2010-2018 is straighter (didn't feel like it during the 2011 correction), but 1992-2000 had higher average return. And, overall, it seems to me that the twenty-year period 1981-2000 was far, far better than 1999-2018. So I don't see what was so once-in-a-lifetime great about the period since the global financial crisis. An article on a site called multifactorworld attributes robust S&P500 performance to some once-in-a-lifetime event? 1992 wasn't climbing up from a crash but it was certainly climbing from a worldwide recession that started in the early 1990s and didn't fully end until 1993. NBER officially dated the end of the US recession as March 1991. In the US unemployment rose until June 1992 with a peak of 7.8% unemployment. Surely you remember "it's the economy, stupid" as contributing to Bill Clinton's defeat of George H.W. Bush? This bull market which is about 10 years old has produced massive gains with little in the way of volatility. Always worthy of looking at it from all angles. Stocks did not even break out above their previous 2007 highs until January of 2013. 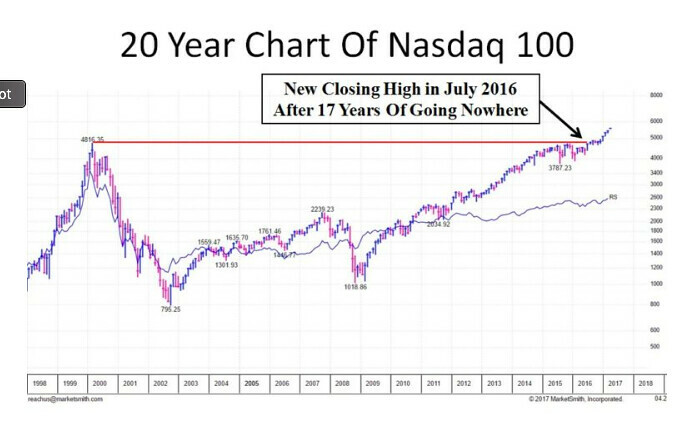 Some, not until 2016/17 in terms of the Nasdaq from previous highs. Using that premise, it's hard to say the bull market started in 2009 at the lows. Most people can’t even consider the possibility of the market going significantly higher from here because, according to the media, this recovery is “long in the tooth” and about to end. However, I have made the argument for months now that we resumed a NEW Bull Market in July 2016 (that really began in Jan 2013, NOT March 2009). Very few people want to talk about the Bear Market that recently happened from mid 2015 to mid 2016 where the average stock corrected over 20% and many of the leading sectors corrected between 25-50%. This year has been a very similar rolling bear market as we experienced in mid 2015-2016 where gains were digested. Going back to 1973, the highest rolling returns were in the high teens, similar to the 16+% quoted last decade. I couldnt easily find farther back than that. We have been in a period of 35 years of generally falling interest rates. Unless PEs go even sky higher those rates of growth cant likely repeat. Now it is possible to have an epic crash and the experience such returns again. I tend to think the writer meant we won't see those types of returns going forward based on today's levels. I don't think he was thinking about the market dropping by 67% and then going up 200% over the following 10 years, although it could happen. -If you think normal distributions are normal, you will find yourself experiencing many once-in-the-history-of-the-universe market events throughout your life and always be wondering how that is possible. -Times of good returns tend to run together for years, while volatility flashes into being. -Superficial people can see that freakish fat tails occur a lot, but freakish tranquility for extended periods is also an inherent market characteristic, which doesn't happen to show up well on histograms of returns. Protracted tranquility should be expected to show up often. -The market's motions scale over vast multiples of time scales. Remember how freakishly calm 2017 was? You should expect that same phenomenon to recur again and again over time scales from decades to minutes. So don't be surprised when it does. I had a few others but I'm a little tired and can't remember them. Anyhow there is already a book on the topic. But to summarize, the article predictably fails to predict the future, but also disregards the past, fundamentally has no foundation on how markets behave, and is a pretty much failure at every level, though the last sentence or two seem OK. I didn't check but the author probably also nailed this sentence "A bit more precisely, the S&P 500 is up 352 percent from March 2009 through October 2018 while international developed stocks, emerging markets stocks and bonds are up 140, 142 and 39 percent, respectively." He said in "in our lifetimes". The next ten years are indeed likely to not be a repeat of the past 10 years. Doesn't take a genius to make that assertion. But he said "in our lifetimes". That statement right there disqualifies him from being taken seriously by anyone, ever. All due respect to you, but you really didn't repeat what he said accurately and in full context. A bit more precisely, the S&P 500 is up 352 percent from March 2009 through October 2018 while international developed stocks, emerging markets stocks and bonds are up 140, 142 and 39 percent, respectively. What you might be surprised to know though (I certainly was) is that it’s almost impossible to simulate another same-length period where the S&P 500 had better risk-adjusted returns. In other words, saying the S&P 500 has done well during this period is a gargantuan understatement. As we will see, it’s done so well that it’s reasonable to ask whether anyone alive will ever experience a better performance period for U.S. large-cap stocks. It wasn't just about the level of returns, but it was risk adjusted returns, and compared to everything else. Some researcher wrote that doom and gloom forecasts attract more attention than optimistic ones. Even if we're talking about risk-adjusted returns, large cap stocks from 2009-2018 only had a slightly higher Sharpe ratio (1.04) than from 1990-1999 (.95). To even suggest that this is as good as it gets, which the author was clearly doing, doesn't make sense to me. Further, the fact that risk-adjusted returns were this high is due in no small part to there not being many pullbacks along the way (a couple of corrections and arguably one 'small' bear market). The period from 1990-1999 had higher absolute returns, and I would personally go for that over higher risk-adjusted returns when it comes to stocks every time. Every time period, every day is unique; therefore, I should get off this blog and go for a run before it starts raining again! While not a frequent event, once in a while I wish this forum had a Facebook-style 'thumbs up'. - The poster that characterized the post as idiotic did so by incorrectly characterizing the content in the article. - the fact that the 90s was "close" doesn't negate the articles point. In fact, the fact that a decade leading up to the biggest US stock market bubble in history didn't match it (on a R-R basis) only supports articles point. - sure, it is always easy to say, after the fact, that you would have preferred a riskier investment with higher returns. I'm sure we could find quite a few other subsets with higher risk higher return during 90-99. Nasdaq for instance. - the fact that the market didn't go down dramatically 2009-2018 supports the articles point. You seems to indicate it takes away from it. I am not into predictions, so I take no position as to whether it will happen any time soon. But what the author said and way he said it was not at all unreasonable. He even addressed the fact that it seemed hyperbolic on the surface. "The average 116-month period achieved an average monthly excess return of 0.67 percent." Returns are correlated on the month and year levels. He appears to be saying that if we randomly select a sample with replacement from across a very long timeline, the correlations tend to disappear... because the sample was randomly selected. He is not explaining how he bootstraped. But the author is making the argument about risk-adjusted returns, using the T-bills as an adjustment. Because in the 2009-2018 period the short end of the treasury / interest rate curve was so low, we are getting higher risk-adjusted returns. Because someone wanted to write an article about it. I understand the concept of the risk-free return, and, by extension, the risk-adjusted return -- but I'm not sure that that's a real thing.